The Stanley Cup playoffs officially kicked off on Wednesday with a number of upsets setting the tone right out of the gate. But there were three more first-round series that got underway on Thursday night, with some more surprises in store. In what may be the marquee matchup of the opening round, the Toronto Maple Leafs stole home-ice advantage from the Boston Bruins at TD Garden with a big-time statement win in Game 1. It could be the start of a compelling series as the last two times these teams have met in the postseason -- including in the first round last year -- the series went a full seven games and brought plenty of drama along the way. The reigning Stanley Cup champion Washington Capitals started their title defense with a Game 1 win the Carolina Hurricanes, though it wasn't exactly pretty for the Caps. Nicklas Backstrom and Alex Ovechkin had big games to help spoil the Hurricanes' first playoff game in 10 years. In the final game of the night, the West's top seed, the Calgary Flames shut down the Colorado Avalanche on the strength of an incredible outing from veteran goaltender Mike Smith, who was playing in his first playoff game in seven years. Not a bad postseason return. Check out some recaps from the action on Thursday. There was plenty of talk about Calgary's goaltending and which of their guys would be between the pipes as the began their playoff run on Thursday night. As it turns out, it was Mike Smith ... and he was tremendous. The 37-year-old goaltender made his first postseason start since 2012 on Friday and he completely shut the door against the Colorado Avalanche. Smith made 26 saves -- some of them very difficult -- and shutout the Avs 4-0 for a big Game 1 win on home ice. He also had an assist! Andrew Mangiapane got Calgary on the board first with this sweet goal. Matthew Tkachuk added two more -- one coming on a net-front power play tip, the other an empty-netter -- and Mikael Backlund also had a power play tally. This game got chippy at several points and had a bit of an ugly finish, so it'll be interesting to see if tempers carry over into Game 2 on Saturday. The Capitals made an adventure out of their Game 1 win against the Carolina Hurricanes on Thursday night, but they narrowly managed to avoid "pulling a Lightning" in letting a three-goal lead disappear. The Capitals jumped out to an early 3-0 lead on the strength of two goals from Nicklas Backstrom and another from Alexander Ovechkin in the first period of Thursday's game in Washington. Backstrom kicked off his playoff run in spectacular fashion with this snipe. The Caps followed up that goal with two power play tallies, the first coming from Backstrom on the doorstep. The second? Well, you can probably guess. They held on to that lead until the third period, when the Hurricanes finally began to make a push on the scoreboard. It was 19-year-old rookie Andrei Svechnikov who finally broke the ice, then doubled down with another. Carolina continued to push and attack offensively, threatening the Capitals with a strong offensive attack. 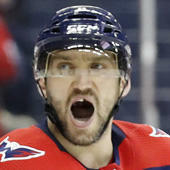 But Washington was able to weather the storm and ice the game with an empty-netter from Lars Eller in the final minute. Demons be damned. The Maple Leafs headed into Boston on Thursday night and frustrated the hell out of the Bruins, taking a 4-1 win to open the series. Toronto came out with a strong first period against Boston on the road, but it was the Bruins who drew first blood in Game 1. After William Nylander committed a high-sticking penalty, the Bruins' lethal power play converted their first opportunity of the postseason. it was Brad Marchand who found a huge passing seam and set up a wide open Patrice Bergeron on the door step. Toronto found an equalizer in the latter half of the opening period when Mitch Marner scrambled to a rebound off the post and was able to put it past Tuukka Rask to even up the score at 1-1. That was the score heading into intermission, but Marner struck again on the other side of the break. The young Leafs winger was hauled down on a breakaway after the Bruins coughed up the puck in the attacking zone. Marner managed to get his second with a nasty triple-move that froze Rask on the penalty shot. As the second period neared a close, William Nylander doubled Toronto's lead when he received a great breakout pass and was able to squeeze a breakaway shot five-hole on Rask. The 3-1 scoreline held until John Tavares added an empty-netter late in the third period, sealing a Game 1 win for Toronto. Overall, it was an extremely rough night for the Bruins and most of their skaters. The blue line had a very difficult night -- Zdeno Chara in particular -- and turned the puck over far too much, allowing a number of breakaways and odd-man rushes. Toronto's defense is considered their biggest weakness, but their own blue liners had a solid postseason debut. They were able to close gaps, cover well and disrupt entries for most of the night -- even if the Bruins' attack didn't make it particularly hard on them.